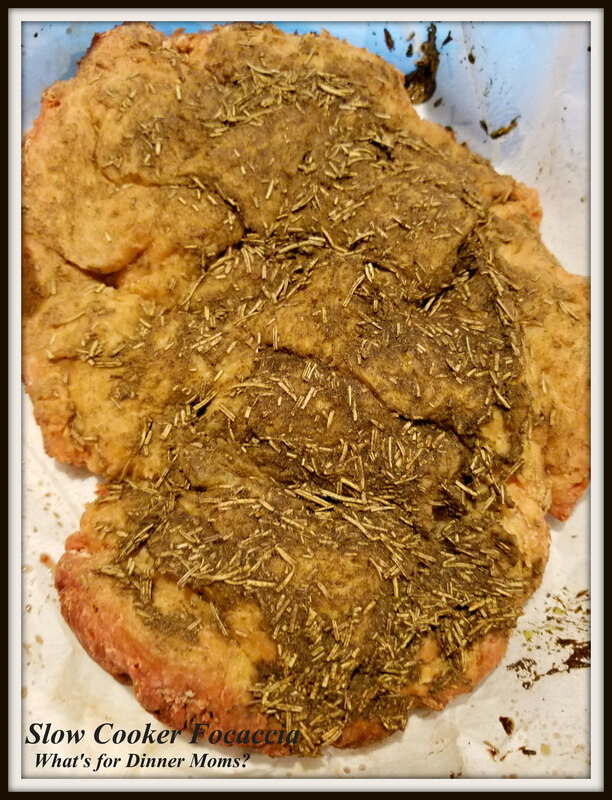 Slow Cooker Rosemary Foccacia Bread – What's for Dinner Moms? How busy are your next few weeks? Concerts, parties, shopping, wrapping, baking, and a few hours at work? No problem. Right? I am already hyperventilating! So, we are keeping all the other things around us as simple as possible. What does that mean? To us it is finding time to still sit down together once a day and have a meal. I am still keeping things semi-homemade by sprucing up packaged pastas, jarred sauces, or frozen meals. This bread is a super simple way to add a homemade touch to those meals. The bread raises and cooks right in your slow cooker. We added a bit too much thyme to this bread but it was tender inside and this recipe corrects our thyme error. We have already been planning other ways to add-on to this bread such as garlic and Parmesan, spinach and feta, or cheddar and onion. This was so simple that we could mix up a batch or two a couple of times a week and not get tired of it. An easy loaf of slow cooker bread with a crusty outside and a soft center. Line the slow cooker with parchment paper so that it covers the bottom and comes up the sides a few inches. Coat with non-stick spray. In a bowl, combine the flour, yeast and salt. In a second bowl, stir together the warmed milk and 1 tablespoon of olive oil. Add the milk mixture to the dough, and stir together until completely mixed. The dough should be sticky. Transfer the dough to the slow cooker, and spread it over the bottom of the bowl. Put the lid on the slow cooker without turning it on. Let the dough rest for 30 minutes. In a small bowl, combine the remaining tablespoon of olive oil with the rosemary and thyme. After the dough has risen, brush the olive oil-herb mixture on top of the dough. Using a sharp knife, make a few slices lengthwise in the dough, about 1/4 of the way deep. Place a towel over the bowl of the slow cooker, place the lid on top of that, and turn it on to high. Remove bread from bowl. Let cool a bit before cutting.